Michael Jenkins CGP, LEED GA founded Jenkins Builders in 2004, with one goal in mind: build a premier product, with quality materials and expert craftsmanship. Since that beginning, delivering custom homes and additions with style and integrity has made Jenkins Builders one of the area’s premier custom home builders. Jenkins Builders has assembled a team of skilled and reliable craftsmen who incorporate the finest building elements into every custom single-family, townhome and condominium they build. It is their special attention to the fine details; interior trim, ceiling treatments and unique designs that has earned Jenkins Builders numerous, prestigious home building awards. But the greatest recognition really comes from the 450 homeowners that Michael and his craftsmen have delighted with their new or redesigned home. The core reason that Jenkins Builders continues to grow and thrive is the respect and referral they have earned from their customers. Recognized by their commitment to the environment, Jenkins Builders is a member of the National Association of Home Builders and the Maryland Residential Green Building Council – where Michael is a board member. 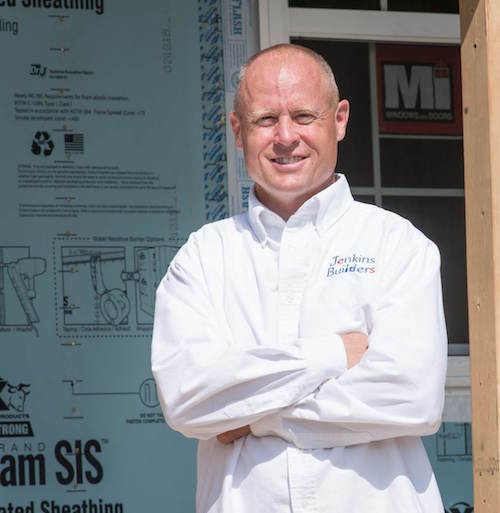 Michael Jenkins is a Certified Green Building Professional – as designated by National Association of Home Builders and has built numerous Nationally Certified Green homes. Building Homes for Better Living.